Larry Hutchinson will report directly to Jim Lentz, president and CEO of Toyota North America. 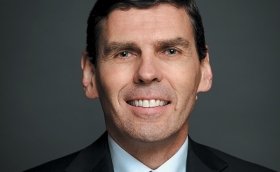 A series of executive appointments aimed to better position Toyota Canada Inc. to address customer needs and enhance sustainable growth includes the first Canadian to lead the company in Canada. Larry Hutchinson, former vice-president of sales and marketing, was named president and CEO, effective Jan. 1. Hutchinson will oversee all aspects of sales and marketing in Canada, reporting directly to Jim Lentz, president and CEO of Toyota North America. Cyril Dimitris, who was managing director of Lexus and Scion divisions in Canada, now occupies Hutchinson's former office, while Jennifer Barron, former national director of the retention service, assumed the helm as director manager for Lexus/Scion. The changes, the company said in a statement, were made to improve longterm sustainable growth in North America and globally. Hutchinson, of Richmond Hill, Ont., joined TCI as an analyst in 1986, and holds a Bachelor of Business Administration degree from Wilfrid Laurier University in Waterloo, Ont. He participated in the launch in Canada of Lexus before taking over management of vehicle-distribution operations. He then assumed the role of director, overseeing advanced product planning, distribution, sales planning and customization development and marketing. He also managed the Toyota Certified Used Vehicles program. Hutchinson succeeds Seiji Ichii, TCI president since 2012, who has returned to Japan to take on a new, undisclosed assignment.